What is the most extraordinary country in the world? In this week’s 123RF World Travel Guide, we begin our journey in adventure packed Guinea. Next, we dive into the most stunning swimming hole in Guyana’s Bassin Bleu. Following that, we uncover medieval and modern in Hungary’s grand Budapest. Finally, we end our odyssey in extraordinary Iceland where we paddle alongside massive glaciers. 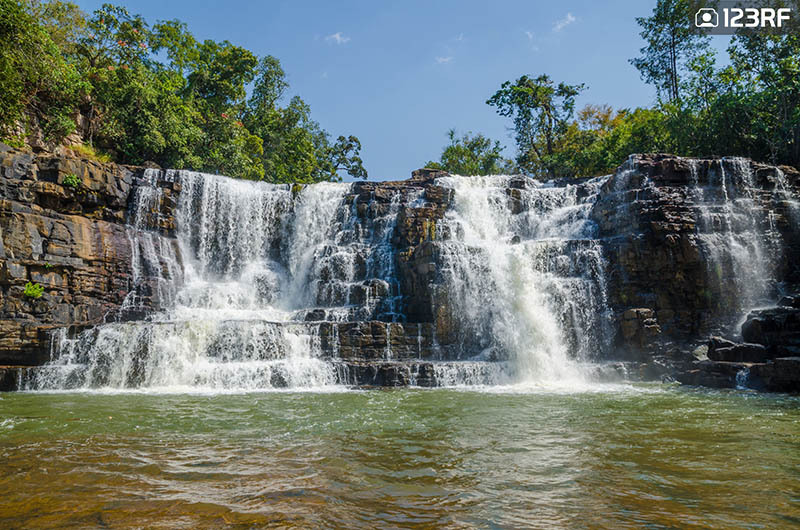 The beautiful Saala waterfall is a testament to Guinea’s natural beauty. Guinea is an adventure. Stunning waterfalls meet lush rainforests and bustling streets meet vibrant markets. The National Park of Upper Niger is one of the most important protected sites in Guinea. The forest is home to an abundance of wildlife. This includes chimpanzees, hippos and buffaloes. Guinea’s beautiful setting is also evident at the Saala waterfall. This pretty sight is perfect for a quick getaway. Additionally, the open paths make it a good choice for a picnic and hike. For a dose of city life, the 123RF World Travel Guide recommends Conakry. The capital city is chaotic and lively. Conakry also has an interesting nightlife and a decent spread of dining options. Meanwhile, the Grand Mosque is the city’s most prominent landmark. Additionally, the National Museum makes for an insightful getaway with its library of religious collections. For something different, take a stroll in the city’s charming Botanical Gardens. 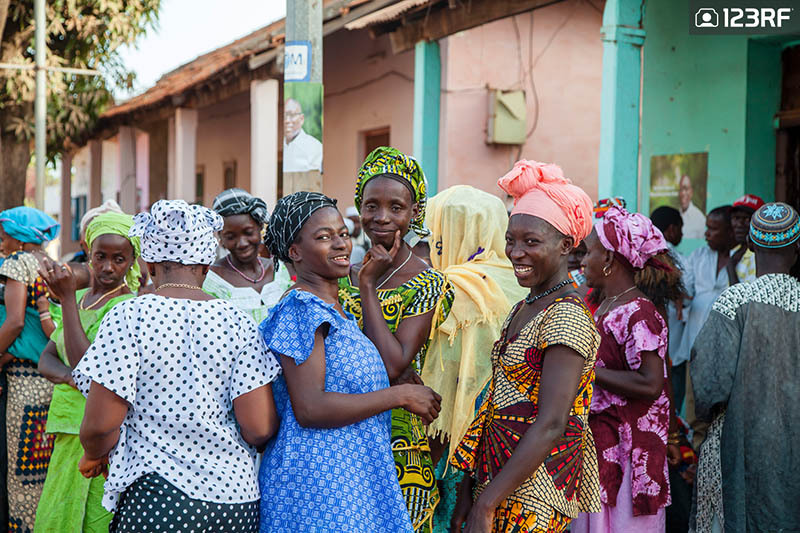 A wedding ceremony is one of the best ways to experience the rich cultures of Guinea Bissau. Image via sigalacavaca@123RF. Situated south of Senegal, this tiny country has everything in store for travelers looking for the road less traveled. After all, how can you resist underrated beaches and fresh seafood? The 123RF World Travel Guide picks Varela as the best representation of this. This remote beach is like your private sanctuary to lay all day and take in the picturesque views. For a walk into the past, visit Bolama. The town offers a detailed insight into the faded glories of the Portuguese Empire. Vines and flowers seemingly burst from bricks in the old mansions. Meanwhile, paint washes away from abandoned buildings in once thriving streets. For something amazing, head out to Orango. Here, watch out for saltwater hippos. Considered sacred by locals, these giants float between the sea and freshwater. Additionally, Orango is home to the legendary burial site of the kings and queens of the Bijagos. For the 123RF World Travel Guide, Guyana is another destination which offers plenty of thrills. Its dense forests are perfect for an ecotourism getaway. And Kaieteur Falls is at the top of the list. 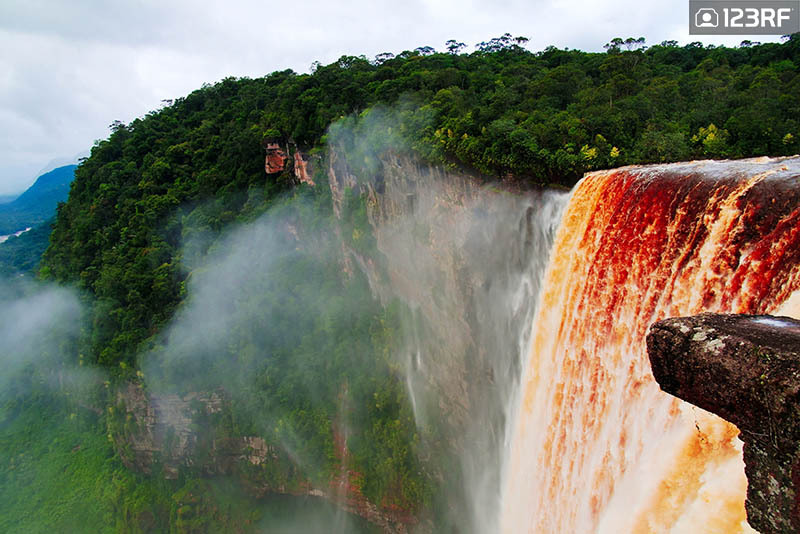 Here, forget Niagara and Iguazu, because Guyana’s jewel is a sight to behold. Set deep in the heart of an legendary forest, over a thousand tonnes of water plunges from a 250m cliff. Thus, forming a spectacular spectacle of nature’s raw power. For those keen to further explore the Iwokrama Forest, head over to its famed canopy walk. Situated 30m above the forest floor, a trip here enables travelers to indulge in surreal views of this massive forest. However, no visit to Guyana is complete without a visit to Georgetown. The nation’s capital is home to an impressive architecture amid a vibrant community. For the ultimate experience, head over to the white, Gothic inspired St George Cathedral. Next, make your way to the colorful Stabroek Market. Finally, end your day with a trip to the Promenade Garden where you can read amid tropical flowers and birds. 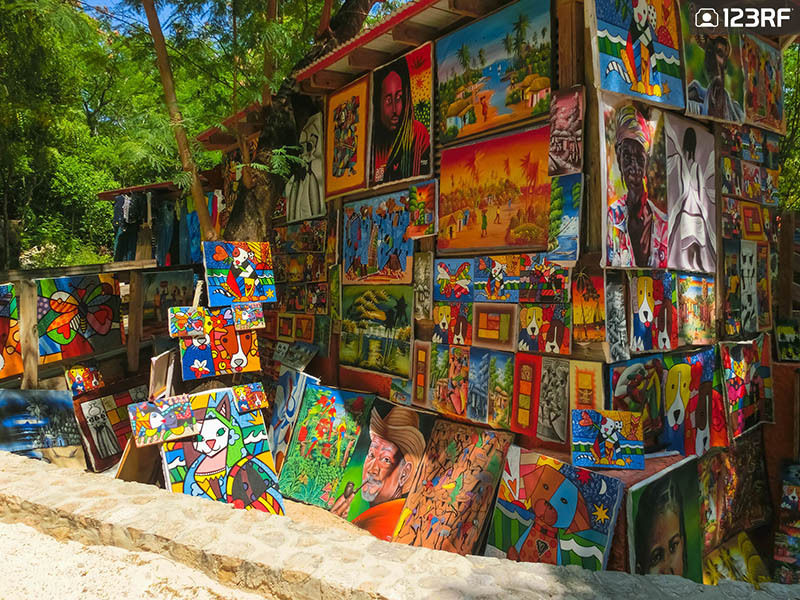 Colorful Haitian paintings are great for souvenirs. Over the past few years, Haiti has suffered. However, like a storm that gives way to a rainbow, Haiti’s turbulent past is now slowly becoming history. The 123RF World Travel Guide recommends to begin your journey in Citadel Laferriere. Dubbed the eighth wonder of the world by Haitians, this impenetrable fortress has evolved into a national symbol. The fort is guided with an army of cannons, and a whole set of drawbridges and hidden passages. If Jon Snow was looking to withstand the attack from the White Walkers, this would be perfect. To dive further into the local culture, look no further than the Grand Rue. This unlikely setting homes an amazing collection of Haitian art. Talented artists turn scrap items to intriguing Voodoo sculptures that promises to push the boundaries of your wildest imagination. For nature enthusiasts, head over to the stunning Bassin Bleu. Situated a short drive from the city of Jacmel, this natural setting is made up of three charming blue pools. However, watch out for nymphs. According to legend, they have drowned divers looking to explore the depths of this mineral rich swimming hole. The Copan Archaeological Site offers travelers a chance to step back into Honduras’ past. For the 123RF World Travel Guide, Honduras is a paradise waiting to be explored. And Utila is the best place to begin. This little island is a backpacker’s dream as it’s one of the cheapest places to live. Once you’re here, head into the open sea and learn how to dive. Next, make your way back to shore and feast on the freshest seafood available. Then, lay by the beach with a beer or two and fall asleep under the swaying palms. Finally, wake up and do it all again. 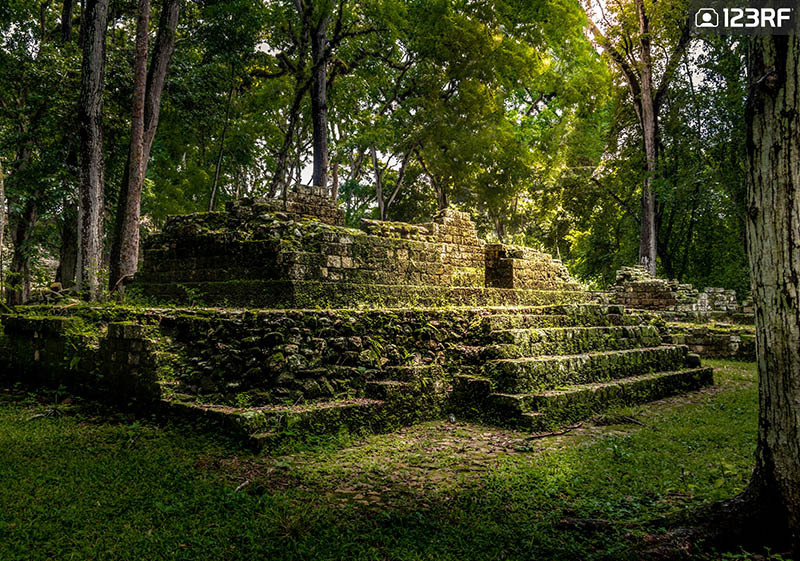 For a dose of Honduras’ past, check out the Copan Archaeological Site Ruins. This UNESCO World Heritage Site offers a rare glimpse into the ancient Mayan days. The minimal media attention here offers you the chance to explore this site all by yourself. Therefore, a remarkable experience indeed. If that does not float your boat, then head over to one of the country’s beautiful national parks. Lend your nose to the breath of fresh air, your ears to the sounds of the birds and your eyes to the mountains, rivers, forests, and wildlife. The courtyard of the famous Szechenyi Baths. Image via Bryan Kinney@123RF. Keen to explore Eastern Europe? Well what are you waiting for? Here, age old wines meet swanky cocktails. Baroque architecture meet state of the art galleries. and ruin pubs meet luxury dance clubs. 123RF World Travel Guide identifies Budapest as the heart of Hungary’s revival. This is where the medieval meets modern, to seamlessly combine and enchant travelers from far and wide. 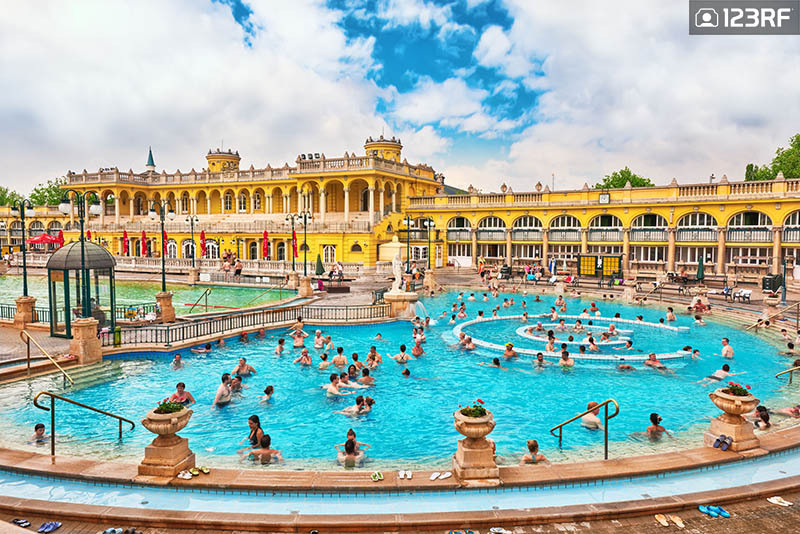 The architecture in the Szechenyi Baths pays homage to the above description. Built in the 1913, this medicinal bath is the largest of its kind in Europe. It’s also a great way to spend your mornings. When the sun sets, Budapest’s nightlife bursts to life. Raday utca is home to a series of fashionable restaurants and bars. For the best experience, head to Puder to enjoy some drinks and stunning visuals which adorns its floor to ceiling walls. For something quieter, head over to Eger. This peaceful town allows you to wander into its colorful buildings while sipping some of the finest wine you’ve ever tasted. 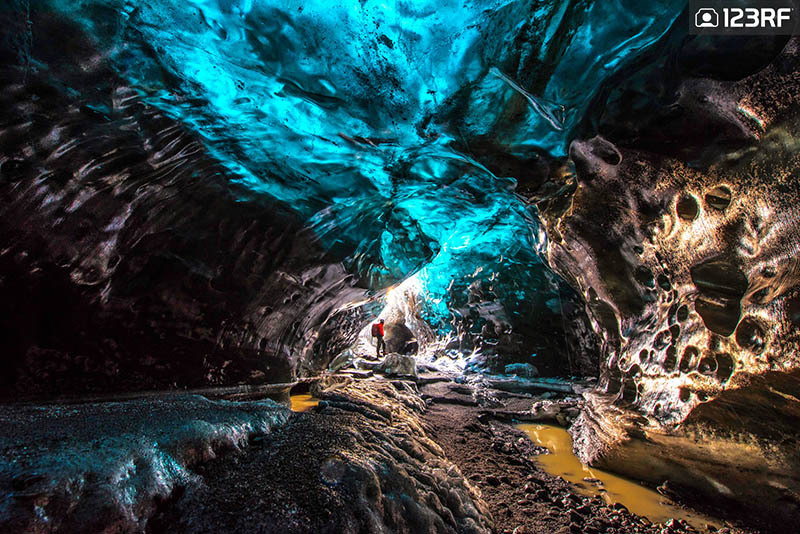 Wander into the ice caves of Vatnajokull for an unforgettable experience. In Iceland, there’s no such thing as ordinary. A walk in the park becomes a trek to explore magnificent fjords. A quick shower becomes a dip in the most beautiful geothermal pool. And Kayaking in the river turns into exploring magnificent icebergs. Welcome to Iceland, the home of the extraordinary. Begin your journey with a trip to the iconic Blue Lagoon. This spa is hugely popular, so pre-booking is advised. However, once you’re there, you’ll understand why. The blue waters brilliantly contrasts the black lava field and green moss. Meanwhile, the water itself is extremely refreshing and nourishing. Hence, its unsurprising that Nat Geo has named this as one of the top 25 natural wonders of the world. Next, head out to the Jokulsarlon where mammoth icebergs drift by as you kayak your way into the ice age. Iceland’s extraordinary allure also takes the 123RF World Travel Guide to the stunning Thingvellir National Park. Translated to the fields of parliament, this is where Icelandic history began. However, Thingvellir’s landscape is what demands the world’s attention. This park is home to majestic fjords, ravines, lakes and waterfall which promises to satisfy your most extraordinary dreams of natural beauty. Next up on our 123RF World Travel Guide, join us as we eat our way to sweet, crispy jalebis in the alleys of India and the best wood fire oven pizza in the hills of Italy. Alternatively, catch up on our previous 123RF World Travel Guide series which uncovered fertility legends in Gambia’s croc infested waters in Kachikally and magical Mayan ruins in Guatemala’s Tikal temples. Finally, be sure to read up on more travel stories to satisfy your wanderlust cravings. Also, do check out more of our content to help design your story for your blog, magazine or website.